I write out a short, brief summary of every beat/ scene and what it’s about. Whatever comes to mind. Starting with each Act, the scenes/beats that takes place from plotpoint to plotpoint (see post from last week re: plotpoints). For some people, it can be cumbersome to do this. For me, it’s freedom because I basically put whatever I want – every relevant thought that comes to mind, without judging the merits of the content and worrying about script format, the good and the bad, etc. I also sometimes use the outline to experiment with scenarios, as well as jot down ideas regarding dialogue, action, etc. Usually writing the outline takes me about five to six weeks. If you think this takes too long and prefer a simpler approach, the other way I like to do it is index cards… or combine both. That’s my wall above for a story I am currently working on. 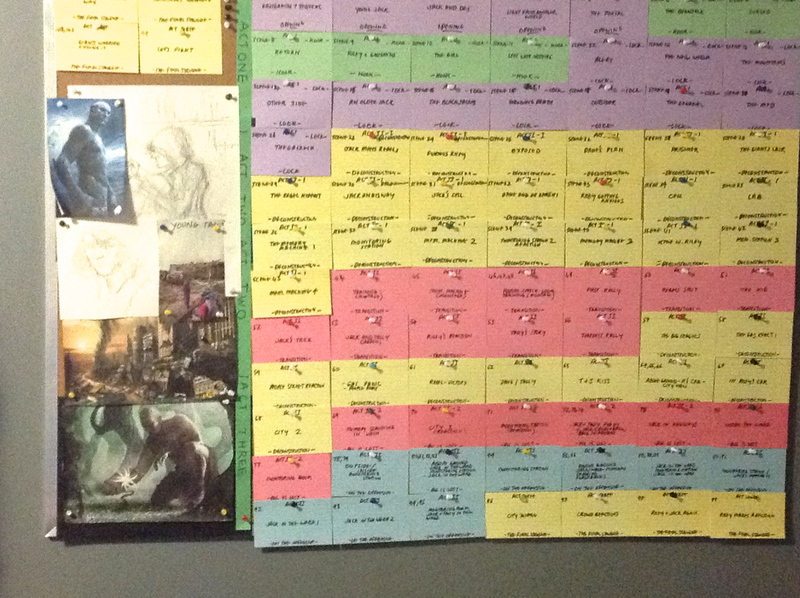 Each set of index card colors represents a different plotpoint. Each individual index card has a couple of words of information regarding the specific scene that can be arranged or rearranged. When I was first starting out learning how to write a script, all I had was Syd Field’s “Screenwriting Workbook” – my introduction to screenwriting, so I never knew anything about outlines or beat-sheets. All Syd suggested (from my recollection) was to do a treatment and then head straight into index cards and putting all my scenes on them. What is the great priority in a first draft? The answer: GETTING THE ENTIRE STORY DOWN IN ONE GO. • Too much editing, fixing, worrying about the details. Ok, so this might sound confusing to some – I just said you don’t want to be worrying about details while writing the first draft and yet I am saying the outline is all about the details. My point is: the outline is not your actual script – its a set of notes to navigate your way through writing your script. All your thoughts, all your hard work in the prep stages has led to this moment…so you have a complete script. The first draft is just the beginning of that journey – but it’s the most crucial step you will take to write your screenplay. Next week: Writing the First Draft. This entry was posted in Screenwriting and tagged beatsheets, before the first draft, first draft, outlines, preplanning. Bookmark the permalink. ← The Art of Time Management! I love reading an article that will make people think. Also, many thanks for permitting me to comment!